Finishing up our printing early this morning. We are packaging printed cards for shipment this afternoon. New online orders will be emailed proofs to review prior to printing. 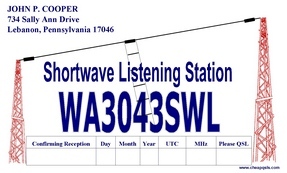 We are often ask if we do QSLs for Shortwave Listening Stations ( SWL’s). We have a section on our website devoted just to that radio hobby and some nice QSLs to choose from.